1kW output: Pure sinewave technology provides clean and safe power. This is the dual fuel version of the HY1000Si, converted to run off LPG as well as petrol, which is ideal for caravan and motorhome users who keep a supply of LPG with them at all times. 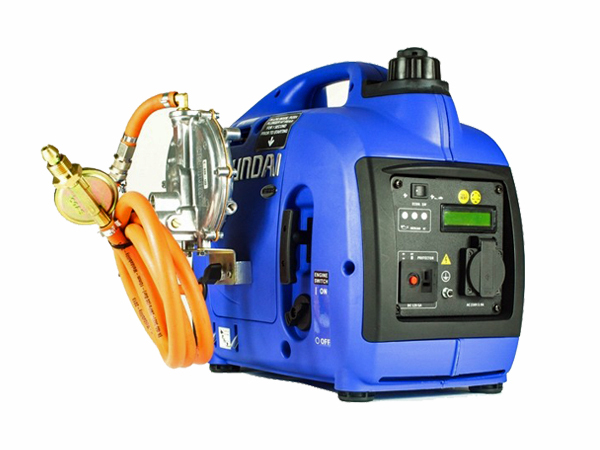 It's the entry-level Hyundai inverter generator and the ideal starting point for any camping, caravan or motorhome enthusiast.It combines affordability, power, a lightweight design and easy portability which is why it has become so popular in the leisure market over recent years. Producing 1000w / 1kW of pure sinewave power, the HY1000Si can safely power sensitive electronic appliances without risk of damaging them, such as laptops, heaters, televisions, chargers, phones and more. The lightweight design, weighing just 13kg, makes this compact generator extremely portable and suitable for taking on holidays. Powered by the 53cc four-stroke Hyundai HX53 petrol engine, the HY1000Si is a recoil start machine with a 2.7L fuel tank. When “ECO” mode is engaged, the engine revs lower to increase fuel efficiency and extend the lifespan of the engine. The HY1000Si is also easy to maintain with digital overload protection and low oil shutdown. The control panel features one UK 3-pin socket which produces a clean 230v output as well as a 12v DC battery charging outlet, so it is ideal for a variety of uses.